On this page, we’re going to walk through all settings available to you in Price Based on Country. Currency format is an option that allows you to change the look of how currency is shown in your WooCommerce store. The currency format option replaces the default WooComerce option currency position because it’s more powerful option. If you want to display the prices like 99.99$ USD you should set currency format as [price][symbol] [code]. The options for Price Based on Country are under the Zone Pricing sub navigation section. This configuration determines which client address is used to calculate the product price. Enable this option if you want the shipping cost will be multiplying by the exchange rate. 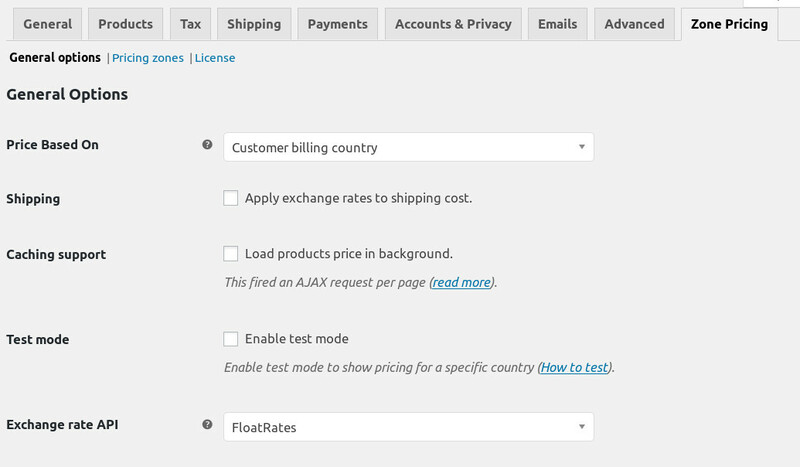 Enable this option to refresh the product price dynamically via Ajax. This solves the issue between Geolocation and the static cache. Read more about Geolocation with cache support. Select to enable the Test Mode by selecting the checkbox, then select country for the test. Test mode option gives you a way to check that prices are fine for the country you choose in Test Country option. If you activate the test mode, a message will display in the front-end of your store to indicating that the test mode is active. You must do the test by browsing in a new incognito window. Read how to browse in private in Chrome, Firefox, and Safari.